Gigi Mortimer is here to protect us all from the dangers of blue light. We talked with EyeJust founder Gigi Mortimer to get the scoop on blue light. What it is, why it’s bad for us, and how we can block it. Learn all about it, and then head to EyeJust and shop their products here to pick up a blue light protector to reduce your eye strain. The generous women of EyeJust are even offering you a special discount code: 15% off if you use the word GROOVE at checkout. Click here to shop now. I’m 57 and have never felt better. Give us an overview of your career? 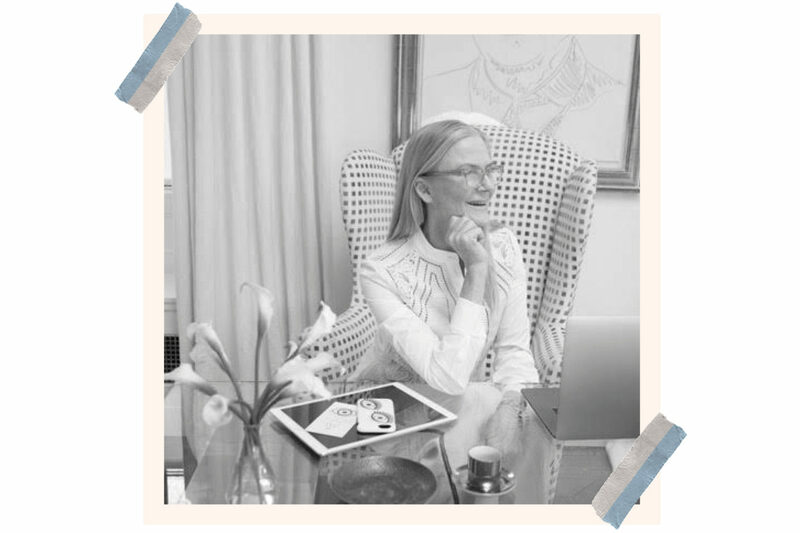 I began my career at Ralph Lauren and worked my way up to Design Director of Women’s Accessories. In 2009, I went the entrepreneur route and founded an accessory brand, Glamourpuss NYC, sold in major retailers. From 2012 until 2018, I was Director of Design Inspiration at Tory Burch. I joined the company to launch Tory Sport and worked closely with the design team to develop both apparel and accessories. Dying to know, “EyeJust”? Is that secret play on words like “I just wanna….”? You seem to have caught a tidal wave of concern; people are finally waking up the damage that blue light is causing our eyes. What woke you? Five years ago my son couldn’t sleep. I didn’t realize that he was watching movies on his phone under his covers after I put him to bed. When I took the phone away, he started sleeping better. Coincidentally, I read a Harvard University study — Blue Light has a Dark Side — about blue light and how it affects our sleep. As an eyewear designer, I knew I could design and develop glasses that would block blue light, similar to how sunglasses block UV rays. So you had the “aha” moment and then what? How did you begin? The “aha” moment was the idea to put the blue light blocking technology onto the screen protector. The screen made the most sense because we are on our phones 7 + hours a day. I also realized that my son and others would not wear glasses while looking at their phones. Who did you rely on for the science of designing EyeJust? Blue light blocking technology was first developed by NASA for their welders. The science doesn’t get any better than that. Starting a manufacturing business from the ground up is so hard–do you have a mentor? Can you share the most important thing you’ve learned from this experience of manufacturing? We have partnered with an amazing Apple approved manufacturer. Our standard is to make the highest quality blue light blocking screen protector with optical clarity tempered glass. Our focus is to protect your eyes first and screens second. This is rather new science. In this litigious world, is liability an issue for you? We have worked with engineers and doctors to develop and test our product. All of our claims are third party tested. We have lawyers on our team to keep us ahead of any issues. What about the news that blue light might be damaging our skin? Where do you stand on the controversy? Clinically, overexposure to blue light can accelerate signs of aging, worsening wrinkles and causing hyper-pigmentation in a similar manner frequently associated with UV radiation and sun exposure. We work with a number of dermatologists who keep us up to date on the latest studies. Of course, once you spend so much time developing a new product in a new realm, the knock-offs follow? How do you combat all the competition? EyeJust is staying ahead of the competition by continuing to advance our technology and research and responding to customer demands. Does the EyeJust screen technology work well with prescription glasses? Any eyeglass applications in the works? What’s next? Our focus is in applying blue light blocking technology to the screen, since it is the first line of defense. EyeJust recently launched iPad screen protectors, which block 46% of blue light. We are expanding our product line to include computer screens. You have done so many other things in your professional life but the press often identifies you as “socialite Gigi Mortimer”. How do you feel about that? I hope that once EyeJust is a huge success, the word socialite will be replaced with entrepreneur, risk taker and health advocate. Bonus questions: If you had a superpower, what would it be? Be aware of the dangers of blue light.